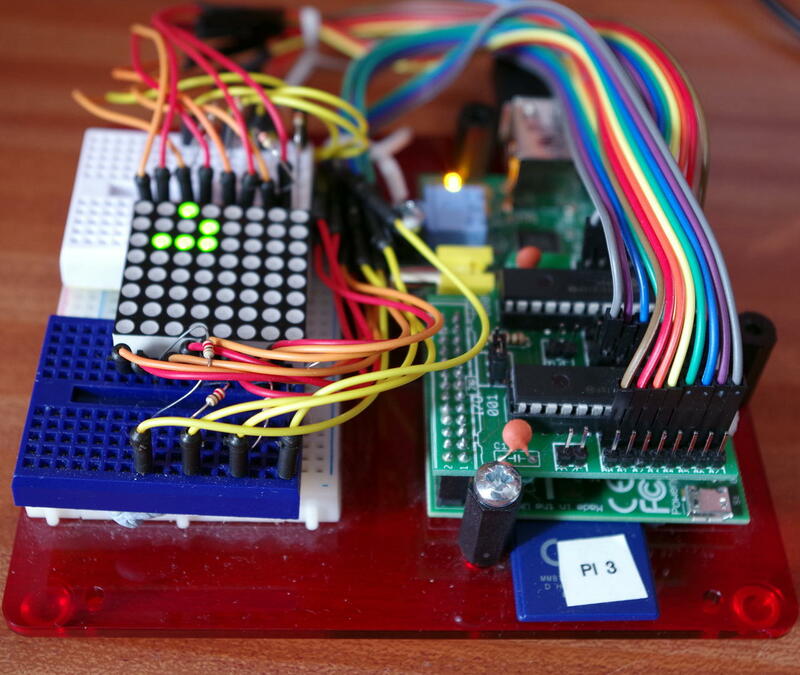 I was looking for some more ideas to use to test wiringPi v2 and Amy Mather’s presentation at the Manchester Raspberry Jamboree gave me a great idea – implement John Conways Game of Life on the Pi using some GPIO expander chips and one of those 8×8 LED matrix displays. Amys solution involved an Arduino to drive the LED matrix, but I’ve used a board with 2 x MXP23017 GPIO expanders on it. Hopefully Life enthusiasts will recognise the pattern in green dots on that display as a glider – and glide it does as you’ll see in the video below! The 8×8 display is bi-colour – Green and Red, so needs 24 bits of IO to make it work properly. As usual, I’m optimising the hardware by slightly increasing the complexity of the software, so I only have 8 resistors here on the commons to the bi-colour LEDs – that means I can only effectively light either the Red or the Green LED at any time. In-Theory I can further optimise the software by lighting up to 8 LEDs at a time, but I don’t. The surface is a torus, so it wraps round without any issues and I’m limiting the update rate to 10 a second here. If you look at the code below you’ll see that the code to output bits on the IO expanders is nothing more than digitalWrite() operations. wiringPi v2 takes care of all the interpretation of the MCP23017’s registers, bits, controls, etc. leaving you to get on with the job of interfacing your hardware! // Set the pins up as we need it. if ((sx == x) && (sy == y))       // don't count myself!